Every yarn has a story. One of the new lines that we took on last year was Isager, which is a mainstay of Denmark’s knitting world. Designer, weaver and textile printer Marianne Isager, for whom yarn production and pattern design go hand in hand, took over the company in the late 1970s after the death of her friend and mentor, the knit designer Åase Lund Jensen. Their work draws from the Danish crafts tradition and is also influenced by the knitting styles of Iceland and the Faroe Islands. Today, Marianne continues manufacturing Jensen’s yarns alongside her own. The Spinni, Tvinni and ÅLJ yarns are produced at Henrichsen’s Spinning Mill, a family-owned operation since 1885, with the fifth generation at the helm of what is possibly the last spinning mill in Denmark today. They source wool from other European countries, New Zealand and Australia, and their production methods take heed of environmental concerns and animal welfare. We are proud to be the exclusive carriers of Isager yarns in Australia, and have been thrilled at how warmly they’ve been embraced by knitters. Isager yarns are delicate but strong, and most lines come in a reasonably fine gauge, from lace to light sportweight. The one featured today is one of the few exceptions: the ÅLJ, sometimes known as Jensen. 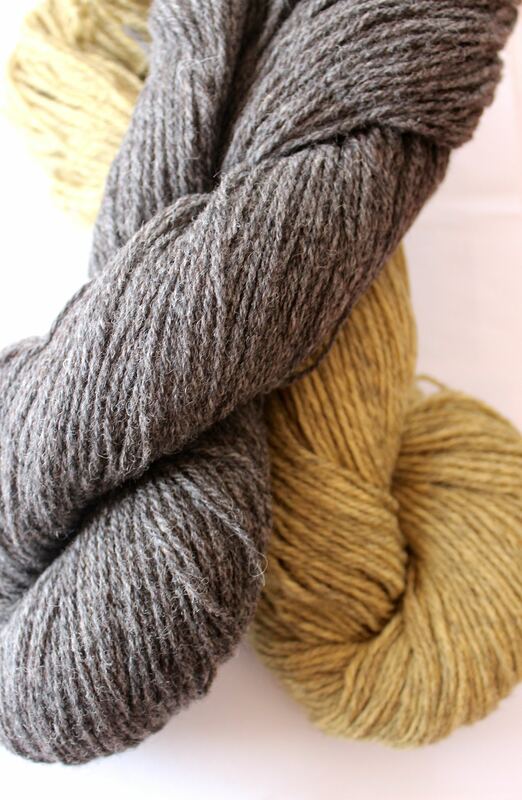 ÅLJ is a heathered yarn that comes in 18 colours. This slightly rustic yarn is not the softest in the hank, but after a wash the swatch above softened beautifully and bloomed. Your garments will wear well for a long, long time. The inherent strength of the yarn makes it ideal for cables, and its crispness shows off stitches well. Each hank has generous meterage too. What to make? A first port of call could be Marianne and her daughter Helga’s designs, published under the Amimono collection, which we stock. Helga Isager’s Siberia Anorak with hidden pockets, a magnificent collar and her trademark geometric motif plies the ÅLJ with a mohair; while we don’t stock the Isager mohair, the Shibui Silk Cloud or Rowan Kidsilk Haze would work well. Here are some other ideas. For a simple cardigan, it’s hard to go past Eunny Jang’s Tangled Yoke Cardigan; the cables would pop and sit beautifully. Kirsten Johnstone’s Rauin is an elegant top-down cardigan with a ribbed neckband that flows down to wrap around the body. Or how about this beret of Pressed Leaves by Alana Dakos? 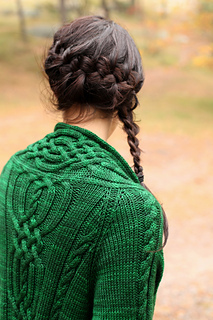 The pattern is from her beautiful book Botanical Knits, which is full of woodland-themed patterns. Another clever pattern is Georgie Hallam’s Lavender Hat, a simple slouchy that is knit inside out so there’s no purling and has a little mock cable worked without a cable needle. The traditional Shetland Hap shawl is a thing of great beauty, makes a perfect gift or for snuggling under in the winter months. Gudrun Johnston from The Shetland Trader’s Hansel can be easily adapted to make a larger shawl depending on how much yarn you have; Brooklyn Tweed’s Kelpie uses a non-traditional construction and is triangular. Both are exquisite. If you want something super simple, try this endlessly adaptable reversible cowl. Make a long, light loop with a single strand of yarn, or knit two (or three or more!) strands together for a chunky finish. 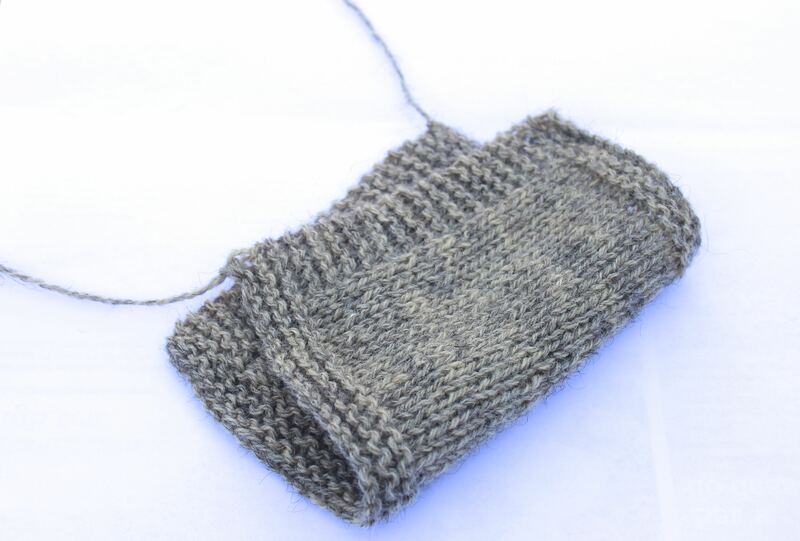 This sample (not made in ÅLJ) is knit in the round over an even number of stitches, so first make a swatch (sorry). Work out how long and wide you’d like the loop. As a rough guide, for a cowl measuring about 120 cm/48 inches around and 15 cm/6 inches wide, you need to cast on 180 stitches. Cast on an even number of stitches and join to work in the round. Round 2: K1, P1, repeat to end. Repeat rounds 1 and 2 until the desired width, and bind off. In store news, we have some neon Zara in-store. Now’s your chance to work up Stephen West’s Syncopation Adoration hat or a Bundled in Brioche scarf to brighten up winter days. Make your own happy socks with these self-striping yarns from Yarn vs Zombies! The yarn is lofty and luxuriously soft, the wool coming from Tasmanian Midlands sheep raised on sustainable farms. 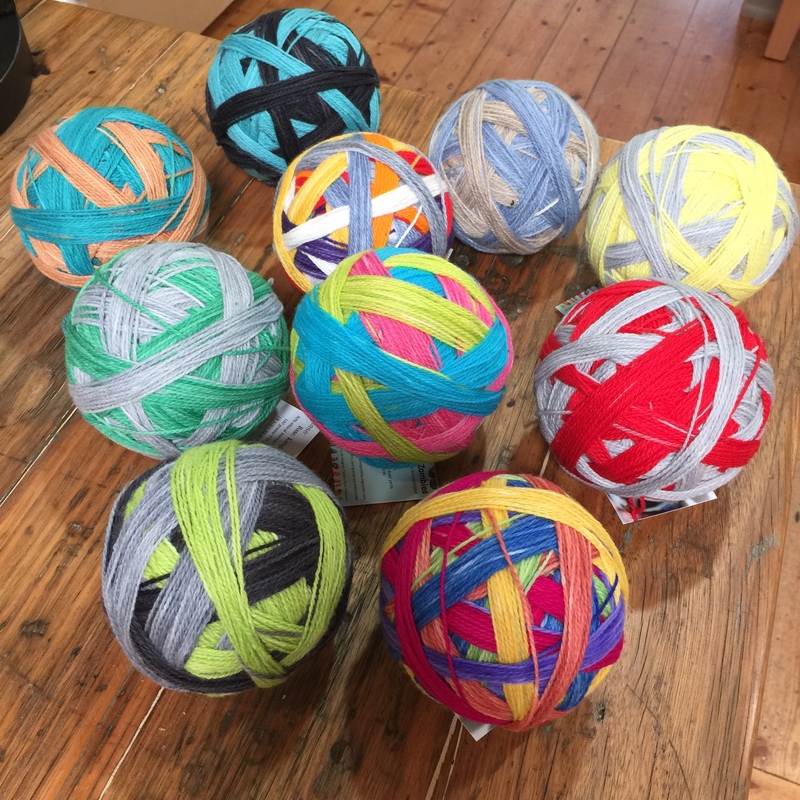 Each ball is hand-dyed and hand-wound, and stripe thickness varies depending on your gauge. Its generous yardage (about 470 metres per 100 g) means you should get a pair of socks from each ball. 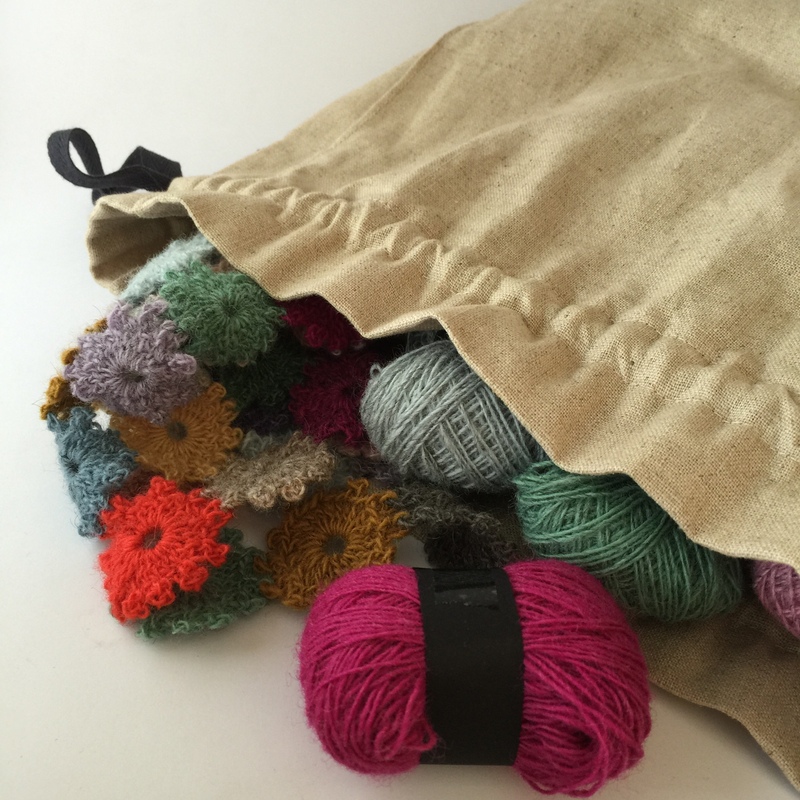 Finally, to carry all your projects around, we have some specially made project bags for the store. These beauties will hold a jumper-sized project, and the close-weaved linen/cotton blend means your needles won’t poke through or go AWOL. Categories: In focus, Knitting, New, Yarns | Tags: ALJ, Australian yarns, Brooklyn Tweed, Isager yarns | Permalink.